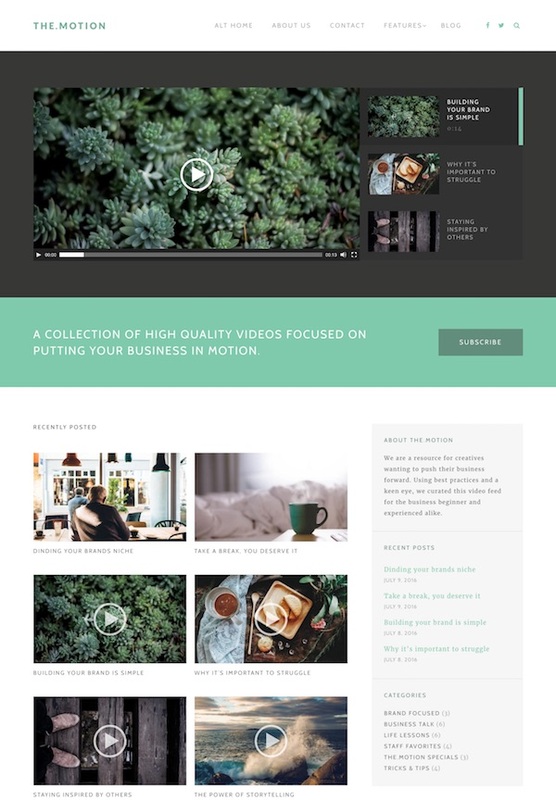 This is a collection of the best video WordPress themes for vloggers, videographers, video websites, video sharing sites, and other video websites. WordPress is an excellent platform for building a video website, video portal or vlog. While building a video website with these themes wont automatically help you become a YouTube sensation like Casey Neistat, they will help you create a professional video website quickly, easily and cheaply to showcase your video content. With the latest versions of WordPress you can easily add video in any theme, but these themes have been created specifically with video in mind for the vlogger, videographer, video sharing or multimedia website. Not listed in any particular order, the themes below are the highest quality multimedia and video WordPress themes currently available. This is a dynamic gallery and regularly updated with new video themes when quality templates are released. 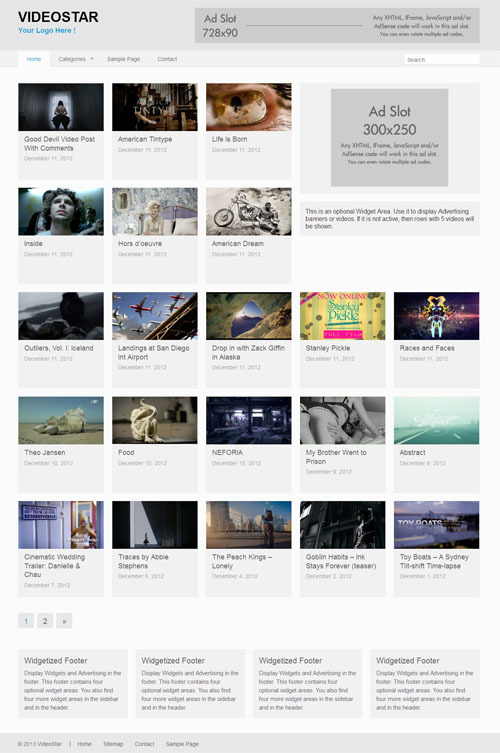 Viem is a video WordPress Theme that allows you to collect and share your favourite videos online. You can set up your own website and stream your own media using Viem. The premium theme has a nice user interface with great UX, and comes with multiple homepage variations. The theme integrates the popular plugin Elite Video Player – a modern, responsive, fully customizable high-end video player for WordPress that support advertising and the most popular video platforms like YouTube (single, channel, playlist), Vimeo, self-hosting videos (only mp4 required) and Google driver videos. A mobile responsive and adaptive WordPress video blog theme from RichWP with state-of-the-art Minimal Design shows your audience that you are up-to-date with today’s design trends. Vidiho is a premium video blog WordPress theme from cssigniter. 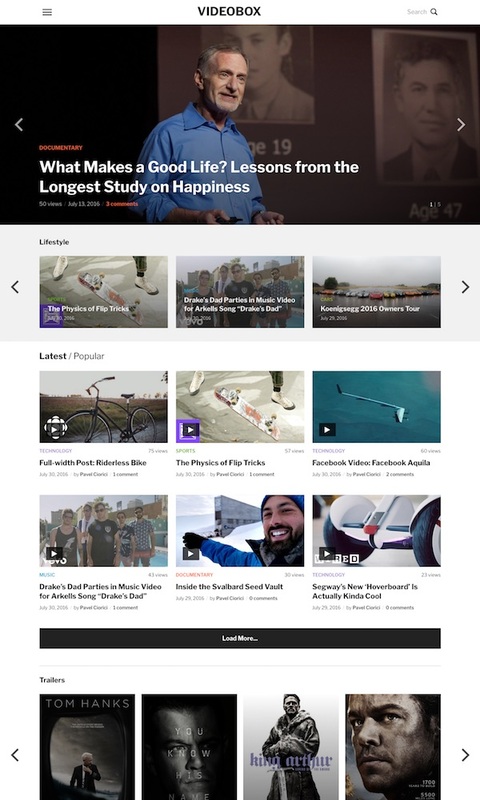 The mobile friendly theme has a blog magazine style design with a large and impressive video slider on the homepage to showcase your best high definition videos. Vidiho uses WordPress’s built in video functionality so you can easily embed videos from a variety of third party video sharing websites. The Vidiho theme is not limited to being just a video theme. You can also use it a normal blog or online magazine theme if you wish. Some of the other key features of the theme include: listing page video previews (you can preview any video in a lightbox), responsive and retina ready, shortcodes, localization options, colour variations, coded to WordPress best practise, custom menus, theme options and more. 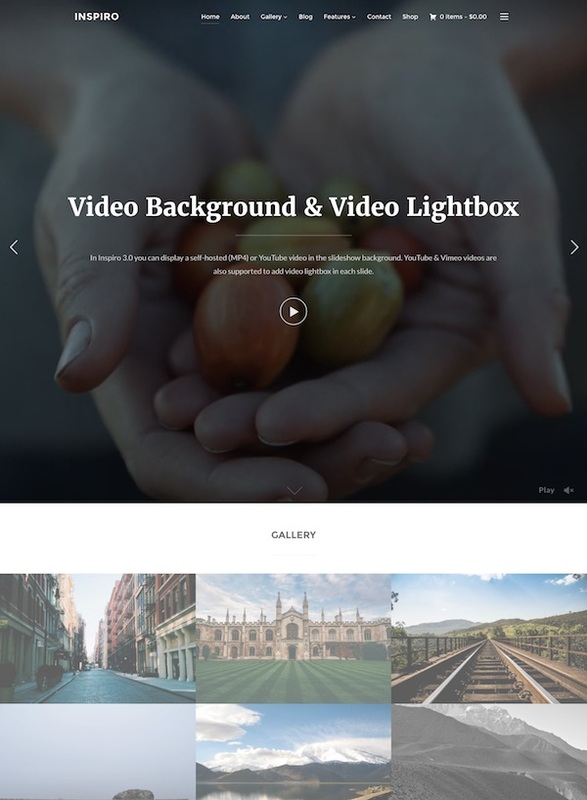 Vlog is a beautiful multimedia WordPress theme designed with a strong focus on videography. The premium theme would be ideal for video content sharing websites, viral video sharing sites, personal video blogs, magazine sites, websites for video tutorials and lessons and others. The theme will take YouTube, Vimeo, DailyMotion, Twitch or any other video and display it in a unique and attractive way. It allows you to group your videos and articles into playlists and offers more than 200 different post layout combinations so you can present your videos any way you want with an easy to use module system. Some of the other key features include: auto thumbnail detection, watch later and cinema mode, monetization options, multiple header layouts, mobile responsive design, built-in social sharing, easy branding, automatic Youtube video import, and much more. A premium video WordPress theme for embedded and/or self-hosted videos. The premium theme from RichWP has a modern and sidebar-less layout and dark design deeply inspired by some of the largest adult entertainment websites on the Internet. 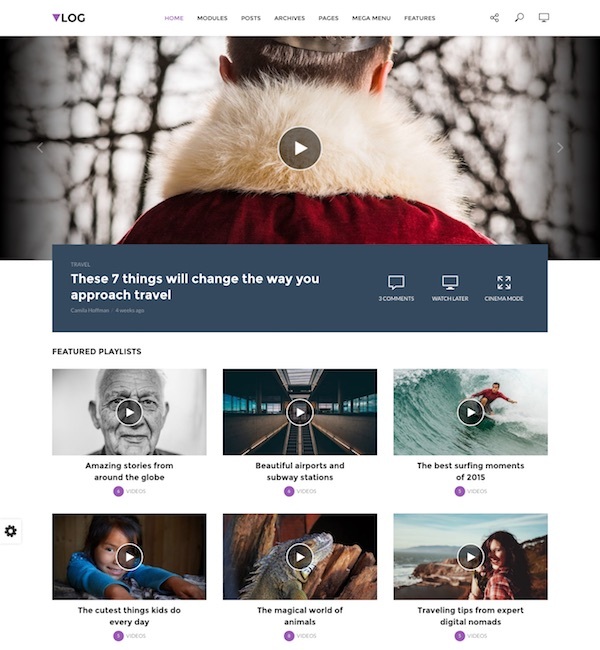 The Motion is a beautiful video and multimedia centric WordPress designed for video blogs, video tutorial sites and other video and multimedia websites. 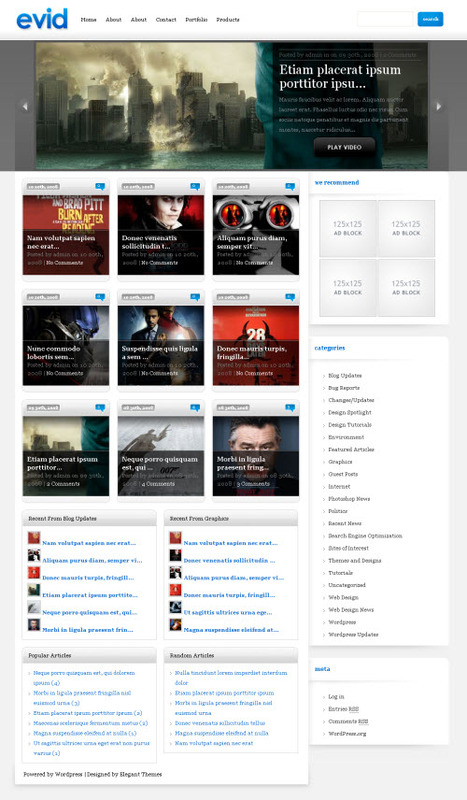 The premium theme from Themeisle has a modern, bold and flat design. Its mobile responsive, uses the WordPress customizer, has WooCommerce support and a heap of other great features. 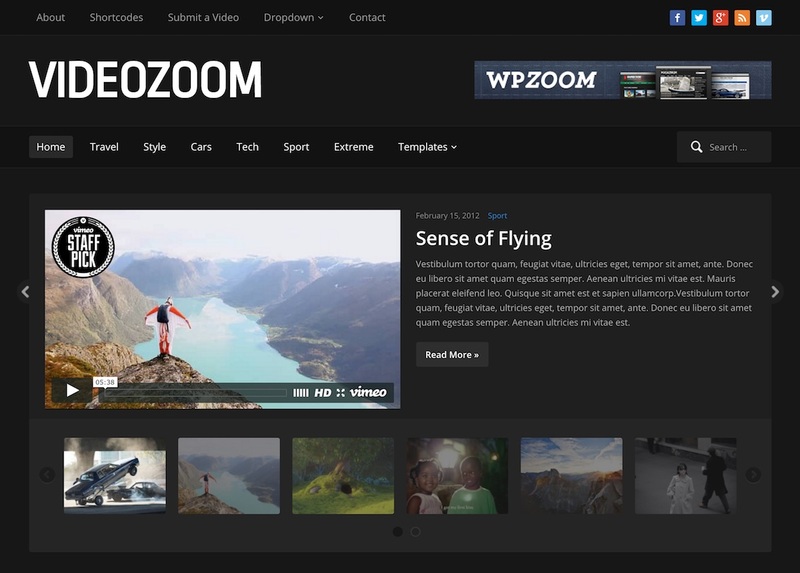 VideoZoom is an elegant video WordPress theme for multimedia websites. The premium theme from WPZOOM has been updated to version 4.0 and features a fresh new design and some major improvements and new features. It now has WordPress native video support as well as full compatibility with the JW Player plugin for WordPress so you can embed an external video or upload your own videos. The new version also brings improved responsive navigation, light skin options, social profiles widget in the header, an improved mobile friendly responsive design, and automatic video thumbnails. Briefly some of the other features include: menu management, custom backgrounds and logo input, easy customization options (colors, fonts, and other styling), slideshows, custom shortcodes, HTML5 and CSS3 code, banner ad sposts, various templates for posts and pages, translation options and more. 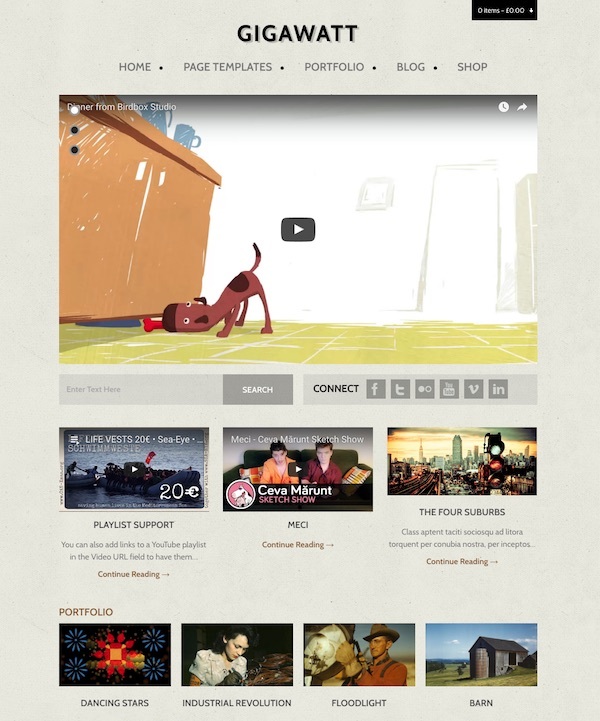 Reel Story is a video portfolio WordPress theme that allows you to present your videos or films in style. The premium theme from ThemeFuse is ideal for film producers, film directors, videographer’s, vloggers, film studios and other content creators needing a professional website design to showcase their films and their company information. Some of the key features and benefits of the theme include: mobile responsive and retina ready, custom homepage with video header, video portfolio module (3 column grid with category filter), various built in layout options and a visual drag and drop page builder, Google fonts integration, simple color picker to change colors, powerful admin framework with lots of control and customization options, translation ready, and more. Vivo Video is a powerful multipurpose video WordPress theme ideal for creating a video portal website. The premium theme from Templatic is ideal for a creating a video platform website like Youtube, Vimeo, Dailymotion, Twitch, Veoh, Liveleak, etc. It has a flexible and engaging design and heaps of features so you can easily create a professional video portal website. You can upload your own videos or embed videos from other popular video websites. It comes with a flexible slider, integration with YouTube for view counts, support for self-hosted videos, several detail page designs, multiple homepage layouts and much more. 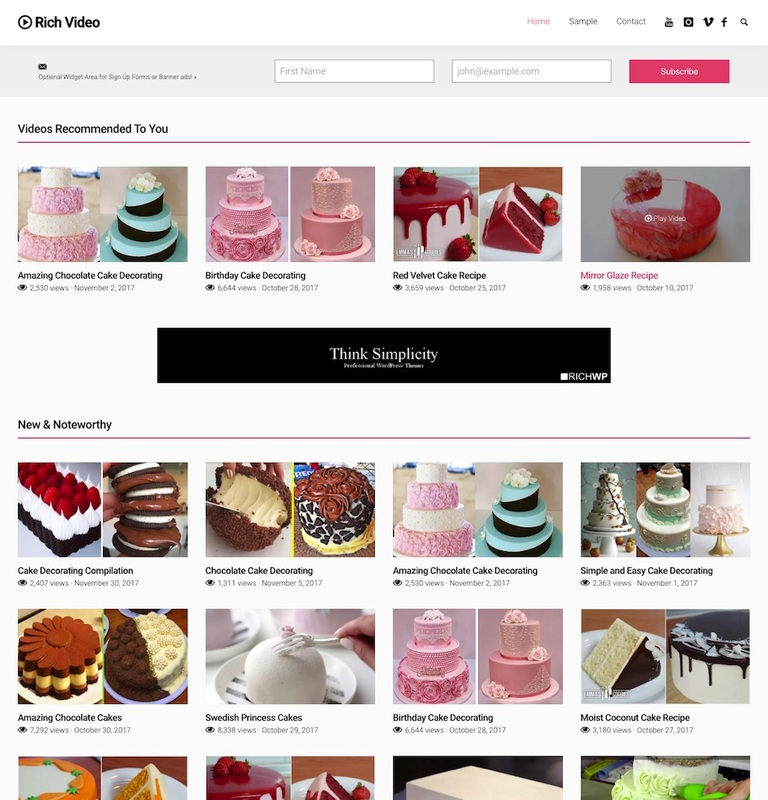 Video World is a video WordPress theme ideal for video blogs and video portal websites. The “new generation video theme” from RichWP is a clean and easy to use theme with a design that’s simple, contemporary, and to the point. The Video World theme has been designed with current standards and best practise in mind and doesn’t lock you into theme specific page builders, shortcodes or plugins. Clear & Clean Video World is a video WordPress theme from RichWP designed for video bloggers, video portal and video sharing websites. The “new generation video theme” from RichWP is a clean and easy to use theme with a design that’s simple, contemporary, and to the point. The Video World theme has been designed with current standards and best practice in mind and doesn’t lock you into theme specific page builders, shortcodes or plugins. 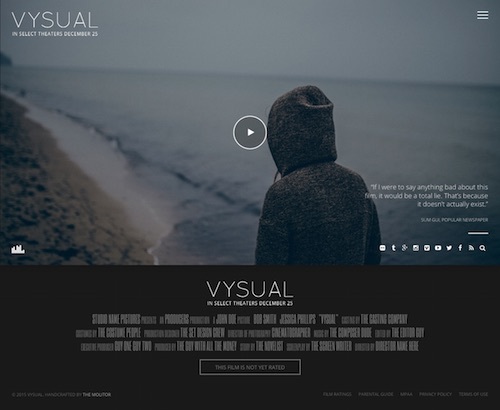 VYSUAL is a premium video WordPress theme built specifically for film campaigns and movie marketing (i.e. “Official Movie Site”). The theme is mobile friendly with a responsive design and utilizes the built in features of WordPress that makes it easy to set-up and use. Some of the key features of the theme include: YouTube, Vimeo and Self Hosted MP4 video support, poster credits in the footer area, video background or image background with slider option, unlimited color options, translation ready, AJAX loading, WP menu support, featured thumbnails, post formats, audio player, advanced jQuery animation and effects, retina ready and more. 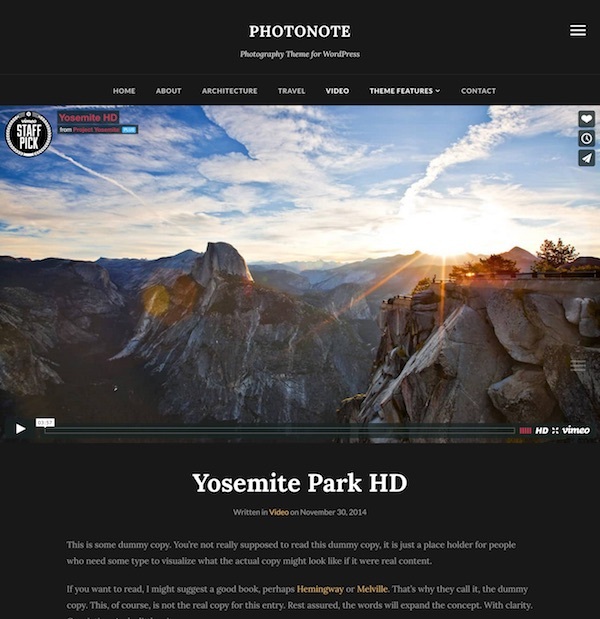 PhotoNote is a beautiful WordPress theme designed for photography as well as video portfolio websites. The premium theme from WPZOOM has a simple and modern design with a dark or light color palette that’s ideal for showcasing your photos or videos. You can easily embed YouTube and Vimeo videos and display your videos in a beautiful full width at the top of posts. It has a heap of other great features and customization options to easily setup and customize the theme to suit your needs. 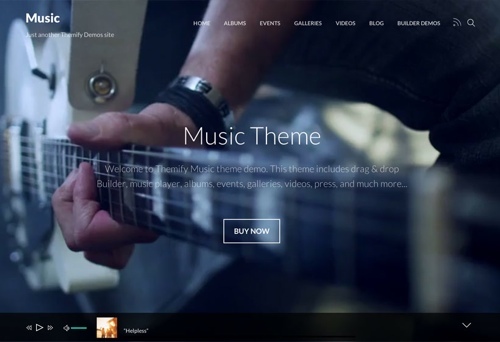 Music is a slick multipurpose WordPress theme ideal for videographers and video websites. The premium theme from Themify has a modern, mobile responsive and retina ready design. Music is powered by the Builder plugin that allows you to build an unlimited number of page layouts with drag and drop ease. Music includes custom post types and other functionality specifically for websites related to music, bands, events, and concerts. 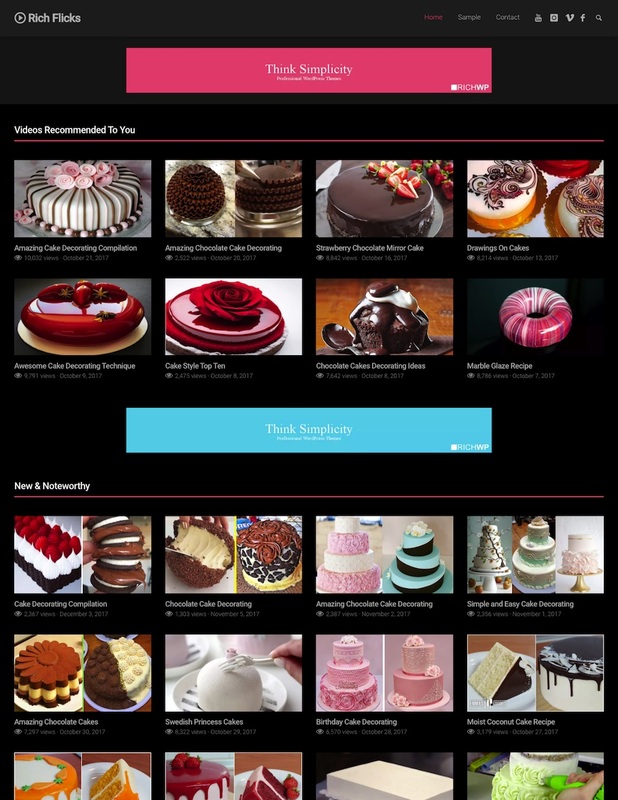 These include: albums and custom playlists, events (include a Google map view of the venue, the date and time of your event, and a link for visitors to buy tickets), photo gallery layouts, video (embed videos from YouTube, Vimeo, and any other video website), press page, footer music player, full width video background, animated background colours, optional single page design, custom header background, blog section , Google fonts, WooCommerce support and more. 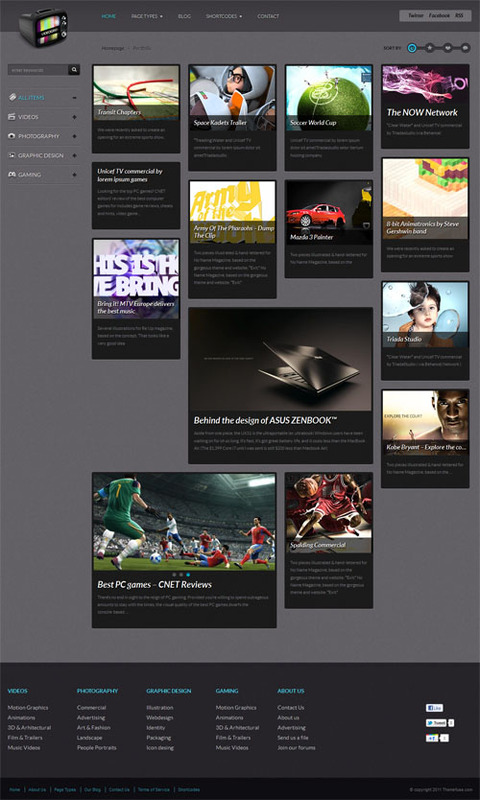 A video and multimedia WordPress theme from Theme Fuse. Designed to showcase all types of media files, the premium theme has a slick and modern design. Features include a creative sort filter with animations for filtering and sorting items, light and dark colour schemes, various page layouts, shortcodes and more. A gorgeous premium WordPress video blog theme from Obox Themes with a vintage / grunge look and a flexible, minimal layout. While the theme is designed for video, and can display videos from any third party video hosting site, it can also display photos instead of video for use as a portfolio or standard blog. Other highlights include 3 colour scheme options, widgetzied homepage for unlimited videos, and a custom video post page with a massive 940px view port. 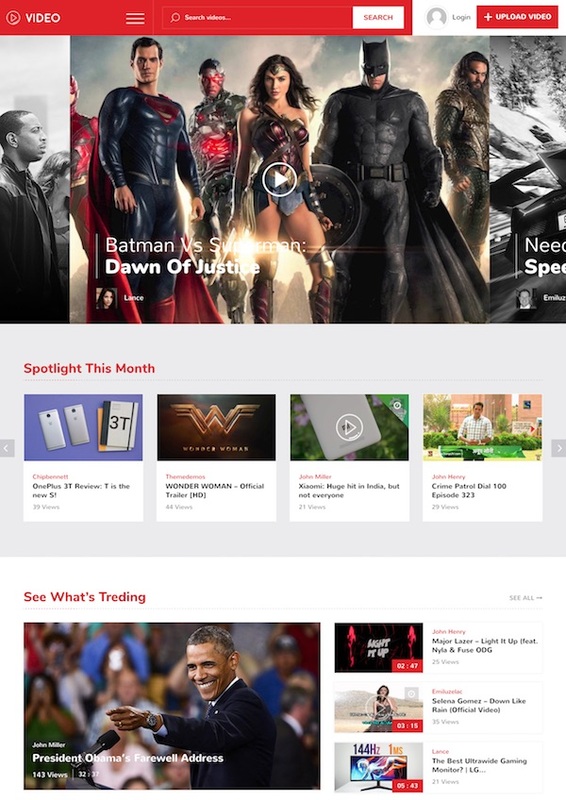 Video Touch is a video magazine WordPress theme that’s mobile responsive and retina ready. It’s built on Twitter Bootstrap and has a clean, modern and unique design that would work well for sites with lots of videos to display. It comes with a powerful layout builder so you can built unlimited layouts. Some of the other key features include: unlimited headers, Google fonts, powerful meta options, infinite color options, 7 article views, front-end submission, custom widgets, mega menu, WooCommerce ready, and more. The Rich Video WordPress theme has a modern and sidebarless design and is the perfect choice for your WordPress based video site. The premium theme from RichWP offers an intelligent way to display a large number of posts that will immediately attract your visitors’ attention right on the front page. The optional featured posts section lets you highlight your best content, while the carefully placed widgetized areas are perfect for displaying revenue generating advertising. 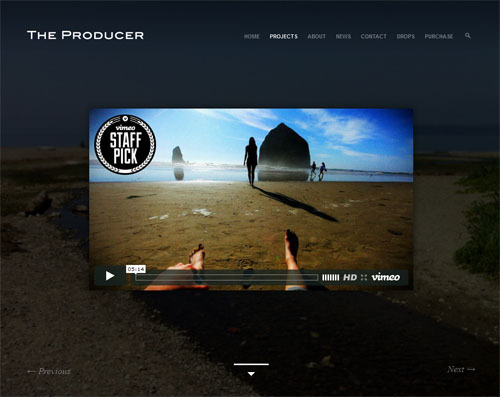 The Producer is a premium WordPress theme designed for film studios, video production companies and independent film makers. The theme was entirely designed around showcasing videos. It is mobile ready with a responsive design so it works on iPhones and other mobile devices out of the box. Some of the features include: unique “panel” effect when scrolling as well as a traditional credit roll effect, light or dark colour skins, easy logo integration, custom full screen image background support, advanced jQuery animations and effects, built in admin options panel and more. Video is a cool video and multimedia WordPress theme ideal for a video blog, video magazine or movie review website. The mobile friendly premium theme from MyThemeShop has a clean, modern and engaging layout with a flat design well suited for a video site. The homepage has featured videos section followed by sections for new videos and the most popular videos. The video post template allows you to display large full width video on the page with a beautiful media player and lots of video features. The theme is compatible with the WP Review Pro plugin so you can add full featured video reviews also. Some of the other key features of the theme include: video thumbnails, video playlists, “watch it later” button, like / dislike feature, integration with YouTube for view counts, custom video player with a custom video view count, Facebook integration, Adsense optimized, unique popup share button, Google fonts, ratings and review system, 3 unique post layout options, 10 custom widgets, different homepage layouts, Schema support, mega menu system, unlimited sidebars, color schemes and backgrounds, mobile responsive, retina ready and more. A premium WordPress theme designed for video bloggers. The theme is set it up to easily integrate videos from video hosts such as Youtube, Vimeo, Veoh, MetaCafe etc. The theme comes in a light and dark colour style. Want to create your own YouTube like website with WordPress? The Video Craft theme allows users to upload their own videos so you can create your own user generated content video website. The theme is perfect if you want to build your own niche video site around a specific topic or interest, or build a small video community website. The premium theme from Ink Themes is not just a normal video theme, but comes with a complete user registration module and video upload module so users can submit their own video files. Users can also easily embed video from sites such as Youtube, Vimeo, MetaCafe or Dailymotion. Some of the other features include a built in Ad Module so you can display Google ads or ads from any other source, black or while colour options, theme options panel and a mobile responsive design so it works on iPhones, iPads and all other mobile devices. 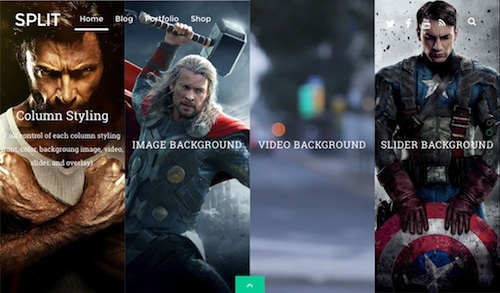 Video Hub is a dark and attractive video WordPress theme with a mobile responsive design from RichWP. 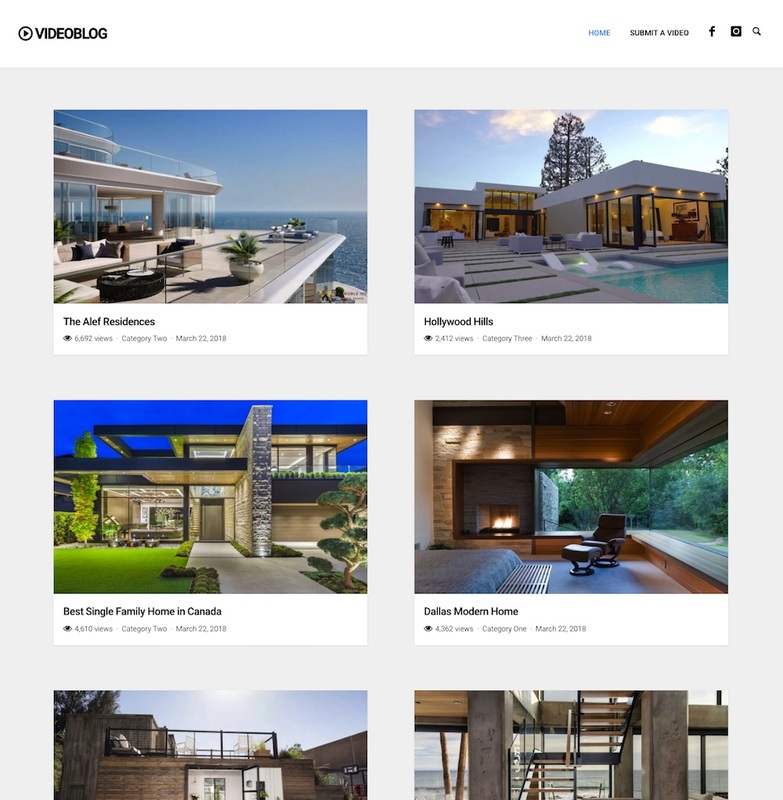 The premium theme allows you to display a large number of posts on the homepage in a grid layout with an optional featured posts section to grab visitor’s attention. Some of the other features include easy logo integration, various widgetized areas for ads or other content, sticky navigation and fading in next / previous navigation, and support for all native WordPress post formats so you can use the theme for a blog or anything else. Video Hub also incorporates a responsive design which means it works on all mobile devices. 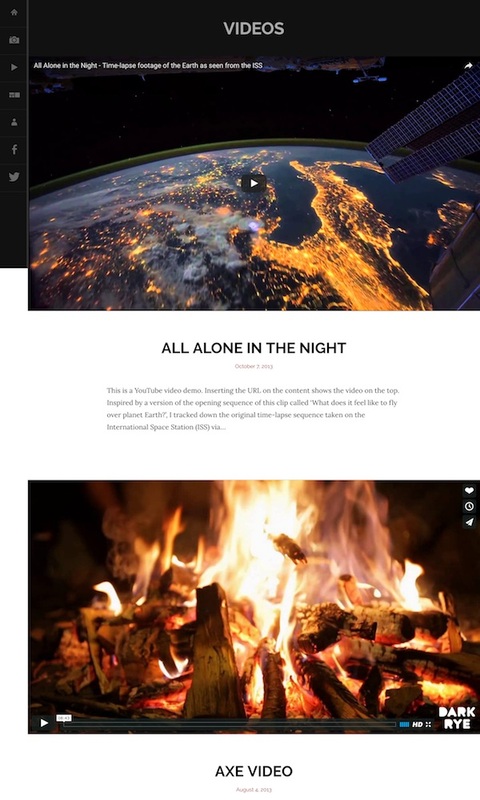 A minimalist, responsive video WordPress theme from RichWP. 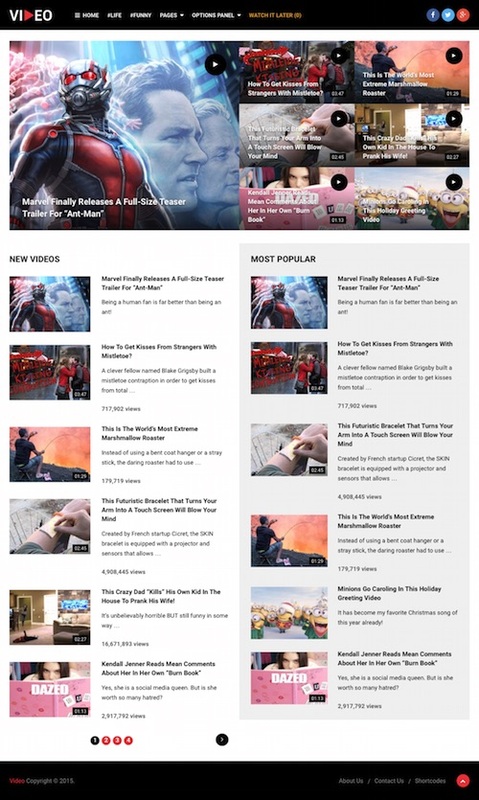 The premium theme has a modern flat design and grid layout which offers an attractive way to display a large number of videos on the homepage and really grab people’s attention. 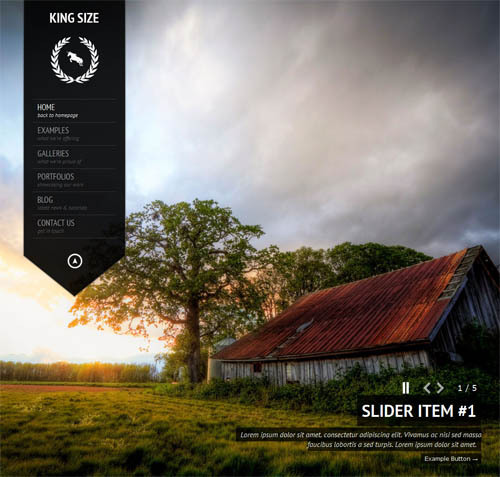 King Size is a customisable premium WordPress theme for photographers and videographers. It has a full screen background for photos or videos, and 5 different gallery types to display your videos and other work. Its supports YouTube videos, Vimeo videos, MP4 videos, Quicktime, Flash, HTML5 and others. The theme has an advanced options panel, custom portfolio post types, shortcodes, elegant typography and more. Solar is a responsive video WordPress theme that is fully featured and easy to customise. The theme has full video support throughout the theme including the featured slider. It is mobile ready with a responsive layout and retina ready for high resolution displays like the Macbook Pro Retina and iPhone. Other features include unlimited colour schemes with colour picker, unlimited sidebars, post formats, custom fonts, translation ready and more. 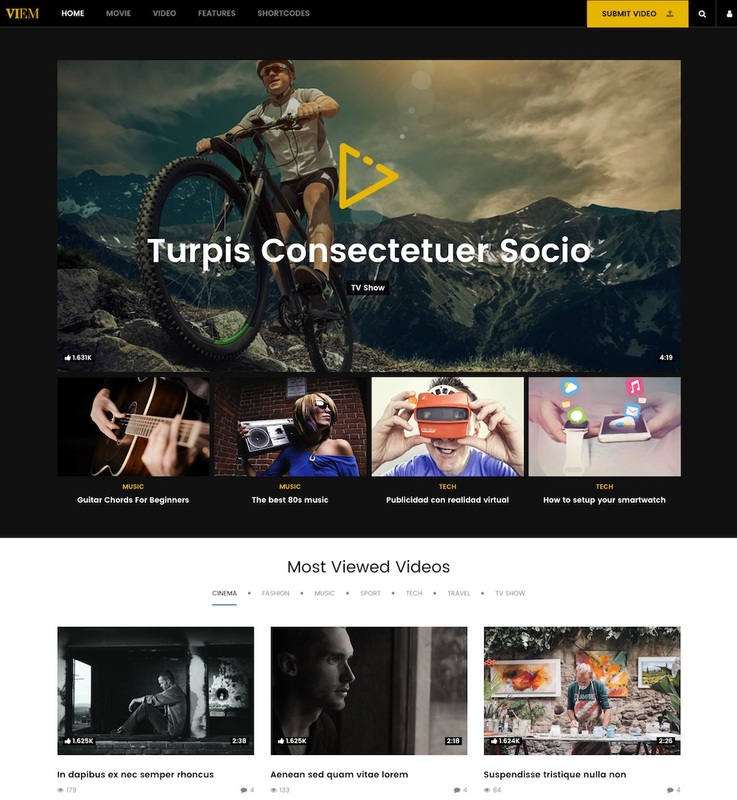 Video is a responsive video WordPress theme from Templatic that allows you to share videos from popular video sharing websites such as YouTube or Vimeo, or use your own self hosted videos. The theme has a decent set of features and options, however its unfortunately let down by an unexciting and dated design. The Video theme is built on a lightweight, fast and mobile-first codebase powered by the Foundation front-end framework. The homepage is completely widgetzied so all the elements can be reorganized and arranged to achieve the layout you want with drag and drop. Some of the other key features of the theme include: simple video management with a separate “video” post type, advanced video category pages with grid or list views, tabs for filtering content, WordPress Customizer for easily changing colours, fonts, logo, background images etc, a variety of custom widgets (related videos, advertising, popular videos, newsletter, social media etc), integrated blog section, WPML support and more. Video Tube is a mobile responsive video WordPress theme that allows you to share your favourite videos from the popular video sharing websites (such as YouTube, Vimeo, Dailymotion, Hulu etc) or upload your own videos to share with the world. It has a customisable homepage so you can create your own layout via widgets, built-in like system, ability for users to submit their own videos, automatic video thumbnails, 6 color schemes, 10+ homepage templates, infinite scrolling option, mobile friendly responsive design, channel page, video sorting options, video post type and custom taxonomy, 2 different video layouts (normal and full width), custom widgets and more.